This unique two-paper system features a pair of "A" & "B" papers to achieve a flawless, full-color transfer with a full spectrum of potential applications - including hard-to-imprint substrates such as nylon, polypropylene, and leather. The solution base on Laser printer and I-Transfer self-weeding paper, what else you need just a heat press machine, you will enjoy fast and amazing printing experience. I-Transfer Laser Dark no-cut heat transfer paper is a revolutionary new self-weeding paper for dark and colored garments that allows you to simply print and transfer to t-shirts, fabric products, bags, hats, and so much more with no need to trim away a background with scisssors or a vinyl cutter. 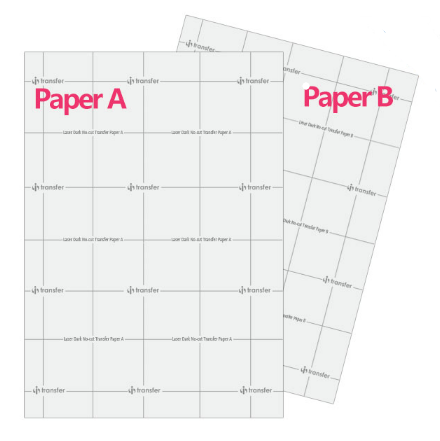 This unique two-paper system features a pair of "A" & "B" papers to achieve a flawless, full-color transfer with a full spectrum of potential applications - including hard-to-imprint substrates such as nylon, polypropylene, and leather. This paper WORKS BEST with a White toner laser printer like the iColor 600 or the OKI Data 920 and 711. In order to get full opaque prints with this paper you NEED white toner to complete the process. It will work on most conventional printers for a CMYK Print on WHITE and LIGHT garments, however for darks you will NEED a White Toner Laser Printer. I-Transfer Laser-Dark (No-Cut) Transfer Paper is a 2-Paper heat transfer foil which lets you print amazing brilliant colors without cutting and weeding. ·As an additional benefit, the no-cut & no-weed means there is no unwanted background on the garment! No residue background creates a soft to the touch screen printed feel! ·Can be used as proofs for screen printing jobs. ·The result can be compared to screen printing – only faster, cheaper and more efficient! ·100% Satisfaction Guaranteed - I-Transfer Heat Transfer Printing Expert. 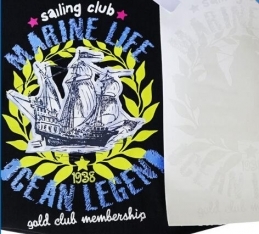 ·Laser heat transfer paper no cut Self-weeding paper reduces apparel production time. ·This paper works great for black only graphics on dark colored shirts.